The LTA2 is an embedded truss anchor for grout-filled CMU and concrete walls that develops high loads with shallow embedment. Designed for 2x4 minimum truss chords, the LTA2 resists uplift and lateral loads parallel and perpendicular to the wall with a minimum heel height requirement. Whether in grout-filled CMU or concrete, the LTA2 must be embedded to the depth of the embedment line stamped on the part. 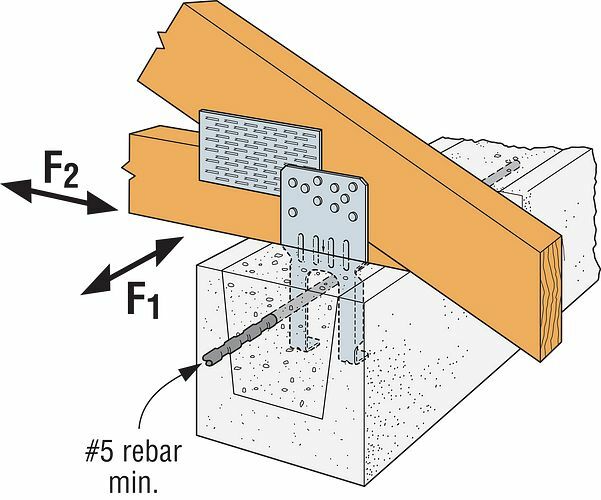 A minimum of one horizontal #5 rebar is required at top of concrete or in the top course of grout-filled CMU. For parallel-to-wall applications, install the LTA2 with flanges facing the center of the wall. Minimum edge distance of 1 1/2" is required. LTA2 allowable uplift on SP is 1,350 lb. for perpendicular-to-wall installation and parallel-to-wall installation. Distance between diaphragm and wall (a.k.a. truss heel height) is no greater than 6"
Trusses are spaced no greater than 24" o.c. 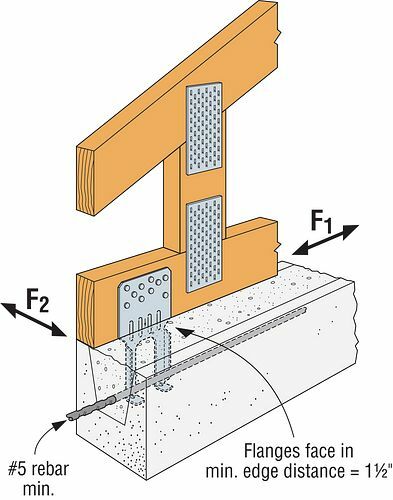 Trusses that do not meet all the conditions above must resolve the lateral load transfer between the diaphragm and the wall by using blocking or some other means.